If you want the cute looks and carefree air of the little Fiat 500 city car but need a vehicle that's more family-friendly, then the Fiat 500X is meant to be right up your street. Its bulging headlights and curved roof make it look a like a super-sized version of the mini Fiat, injecting fun and character into a type of car that's often fairly soulless. The theme continues inside, with colourful panels, chrome door handles and a dashboard that feels well made. A 2018 styling update sharpened up the looks, with LED daytime running lights, new LED rear light clusters and LED headlights on top-spec models. As a small crossover, the 500X is designed to mix the comfort, low running costs and steadiness of the Fiat 500, with the higher driving position and versatility of an off-roader. Getting the balance right is tough but the Fiat manages to be comfortable and quiet, as well as stable in corners - without leaning too much. It responds quickly when you steer, darting into corners, which helps make it feel fun to drive. Where it’s less impressive is in the ownership experience it offers. In the latest 2018 Driver Power new car ownership satisfaction survey, respondents rated the 500X worst for reliability and also for quality out of 75 models. Those criticisms aside, the 500X is a similar package to the Mazda CX-3 and more expensive, but slightly larger Honda HR-V. You'll get a little more comfort from the Renault Captur and Vauxhall Mokka X but these are less enjoyable to drive. A cheaper option would be to buy a supermini such as the Ford Fiesta, Vauxhall Corsa or VW Polo. Family hatchbacks like the Renault Megane, VW Golf and Seat Leon offer more interior space for the price of a small crossover but don't have a high driving position. Although early versions did offer four-wheel drive, these are no longer available for sale in the UK. If you're likely to get yourself onto really rugged ground, then you'll probably be better off with a four-wheel drive Jeep Renegade, which shares the Fiat 500X's mechanical parts, and is also comfortable and composed on the road. There are plenty of other examples of why it pays to choose your Fiat 500X carefully: for example, opting for larger 18in wheels will make the ride bumopier and more uncomfortable; the automatic gearbox is slow to change gear, making the car feel sluggish; and diesel engines offer the best fuel economy but are more expensive and heavier, making the car feel less responsive. The Fiat’s boot is smaller than competitors like the Renault Captur and Nissan Juke but it is versatile: the opening is wide and the rear seats fold down to expand the space. It is a small crossover, so doesn’t feel roomy, but it does have space for adults in the back - as long as they aren’t much taller than 6ft. If you like the design but need more space, then the Fiat 500L people carrier is worth looking at. The 500X received four stars when independently tested by Euro NCAP, offering good protection for adults and children (there are two Isofix points to securely attach child seats). An automatic emergency braking system that can help avoid crashes is available as an option. You’ll get almost 50mpg from this zippy new petrol-powered turbo motor, along with good response at low revs. The smaller three-cylinder turbo engine coupled with City Cross trim is the best bet for families, as it balances peppy-enough performance, economy and a good level of equipment for the price. It might be the cheapest option in the range, but the non-turbo 1.6-litre petrol is both the slowest and the thirstiest. It also only gets a five-speed manual gearbox, and is available solely in the most basic Urban specification. There are three trims in total (Urban, City Cross and Cross Plus). Each higher level means more equipment and a larger price. Petrol models are generally labelled FireFly, apart from the cheapest version called E-Torq. Their power is given in horsepower (hp). 6-speed shows that the car has six gears. Two types of automatic gearboxes are available depending on the engine you choose: either with nine-speeds or an older six-speed version called DCT. The 500X’s engine range consists of a simple choice of three petrol engines.The cheapest option is the petrol-powered 1.6-litre E-torq, which is cheap but feels slow and is less efficient than the smaller and lighter turbocharged options. The two turbo petrol engines are a 1.0-litre three-cylinder with 120hp and a larger, more powerful four-cylinder 1.3 with 150hp. All engines feature stop-start technology. The 1.6 petrol is the cheapest in the range by some margin, but is only offered on the base-model 500X Urban. It is also the least economical, offering only 42mpg; it’s hard to argue a case for it unless cost is absolutely a key factor in your buying decision. Moving up the range, the 120hp 1.0-litre three-cylinder model is much more efficient, and Fiat claims an official fuel consumption figure of 48.9mpg. It’s not all that fast, but it will keep up comfortably with everyday traffic with relatively little effort – even on motorways. The most powerful engine is the 150hp 1.3-litre FireFly Turbo. This delivers plenty of punch, but it’s only available with a slightly unresponsive-feeling six-speed auto, and fuel consumption is slightly less impressive, at 46.3mpg. Urban trim level is the most basic, but still gets plenty of equipment as standard, including a 7-inch touchscreen with Apple CarPlay, Android Auto and a double USB port. There’s also manual air conditioning, cruise control, traffic sign recognition and a lane assist system. Moving up to the City Cross version brings a more ‘off-road’ look, with bigger 17-inch alloy wheels, front and rear bumper skid plates, body-coloured door mirrors and front foglights. In terms of equipment, you’ll also get a 3.5-inch colour TFT monitor, climate control and rear parking sensors. The City Cross, like the top-of-the-range Cross plus, comes with either the 1.0 or 1.3 FireFly turbo engines. Speaking of the Cross Plus, this adds full LED headlights, 18-inch alloy wheels, roof bars and dark tinted rear windows. Inside you’ll get integrated TomTom navigation on the 7-inch touchscreen, a rear parking camera and a dusk sensor. Oh, and a front armrest. From new, the car comes with a three-year warranty. You can cover an unlimited number of miles in that time, which is good news for high-mileage drivers. Small crossovers are still a relatively new type of car and demand for used models is still uncertain, which means that they are likely to be worth much less as used models than new ones. The 500X is predicted to be worth about two-fifths of its new price after three years. It loses much of its value in the first year, which makes nearly-new Fiat 500X deals great value. In 2018 the 500x received a facelift - with new LED lights at the front and rear. The Fiat 500X is an attempt to graft the Fiat 500 city car's cute looks onto a more family-friendly model. The high-specification Lounge version has chrome strips outside, and 18in alloy wheels as standard. These make the ride a bit harder and more uncomfortable. Tinted rear windows are standard on Fiat 500X Lounge models and rear parking sensors come with all but the cheapest Pop model. In any case, rear visibility is good. 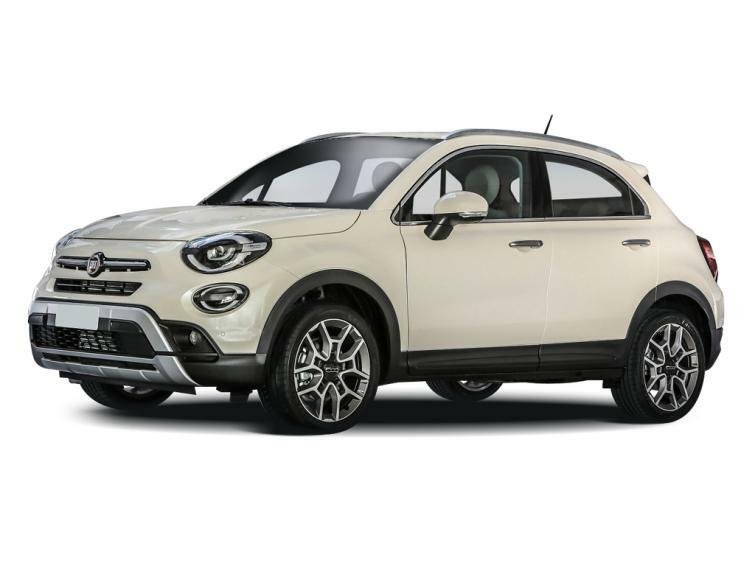 The Fiat 500X Cross is one of the two Off Road Look 500Xs, which have chunky bumpers and an electronic system that'll help you avoid getting stuck in mud and snow. Optional four-wheel drive improves the car's off-road ability even further. All Fiat 500X Off Road Look models have grey dashboard panels. The Cross Plus version has a bigger dashboard touchscreen than the cheaper Cross. All City Look Fiat 500X models have dashboards painted in the same colour as the exterior paint. They also have buttons on the steering wheel to control your music, as well as a USB port. The Fiat 500X Lounge and Cross Plus models have 6.5in touchscreens on the dashboard. These come with sat-nav as standard, as do the 5in touchscreens on Pop Star and Cross cars. The Fiat 500X Lounge is meant to be the most stylish version of the family crossover, which means that it gets synthetic leather inserts in seats as standard. The digital display behind the steering wheel in the Fiat 500X can display fuel and temperature information, as well as a digital readout of your speed. It can also be used to alter some of the car's settings. 500X Lounge and Cross Plus models have colour screens. Fiat allows you to change the car's driving settings for a sportier feel, for example, with this Drive Mood Selector. It's fitted to Pop Star and Lounge cars. Cross and Cross Plus cars have a traction setting that gives you more control on slippery surfaces. The Fiat 500X's boot is a little smaller than rivals, but has a wide opening that makes it easy to load luggage. It's no limousine, but there's space for adults to sit in the back of the Fiat 500X without feeling too sqaushed.